Zeke, the guy who mows my lawn, is taking some horticultural classes at College of DuPage. He was told by one of his instructors, that flowering and blooming plants are 5 1/2 weeks ahead of where they would be normally. I can see it now. The lilacs are done. I spent part of last Saturday just smelling them. I see where Hallmark has a lilac candle available for Mother's Day. I wonder how close it is. And, I need to make a distinction here. 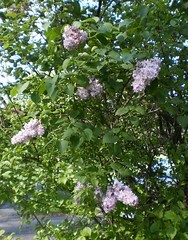 The late blooming lilacs, the small flower clusters on an equally small plant, are Miss Kim version. 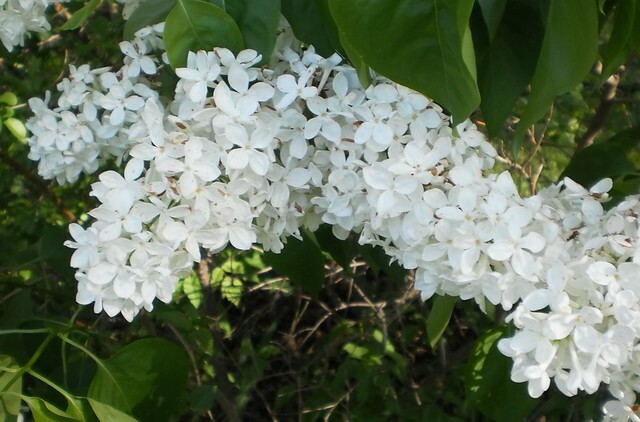 They have a spicy scent which is okay, but I prefer the Persian lilac version. 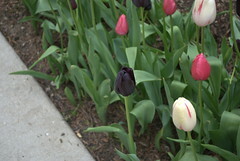 The white ones are called "Abraham Lincoln". I need to spend some time over the summer, pruning my lilacs back. They only blossom on old stalks and pruning all the suckers they make leads to more sturdy plants and more flowers. More flowers is very good. I'm struck by the dearth in color now. We've got typical spring weather; upper 50's to 60's during the day, upper 30's and 40's with the occasional frost warning at night. 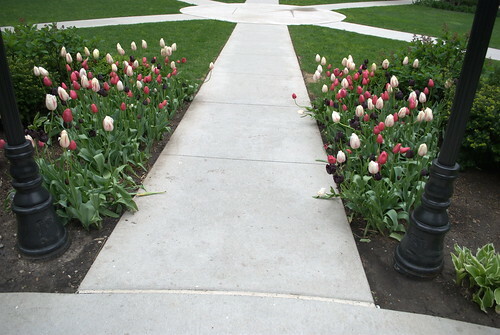 This would be the time where tulips would be everywhere. Nothing much is left. We were all thrilled with the exceptionally warm March, but now the color that is missing reminds me unseasonable isn't always exciting. I spent Friday in the city on a project. The building where I was at has this amazing side garden. The tulips there are the end of the season tulips and were at peak. and Queen of the Night tulips. I love the dark juxtaposed with the light colors. I see this and think, you know what would be an incredible sight, Queen of the Night tulips with late season yellow. Yes, it would be my Iowa black and gold, in my yard. Doing that means actually getting my strength to a point where I can dig up a section and plant tulips in September. Not sure that's going to happen, but this display inspires me. As the weather warms, I'll be filling pots and growing flowers. Maybe, mid-May, a trip to a plant center could be in order to add color to the yard. Right now, while the green is lovely, I'm really missing the scattered color you'd normally have at this time. Maybe Mother Nature did this so I wouldn't be so anxious for a change of season. I like this quote from Robin Williams, or at least attributed to him, "Spring is nature's way of saying, 'Let's party!'". I'm wishing the party hadn't been so early.